Air Fryers have to be one of the best cooking inventions of the decade! They can be used to quickly cook a ton of foods. Boiled eggs are a staple of low-carb and ketogenic diets, and with an air fryer, in just a few short minutes, you can have a batch of eggs that are just as yummy as boiled but are accompanied by zero cleanups! Get an air fryer here! After the eggs are cool, peel and eat! You can boil water in your air fryer. I am not sure of the exact specs, but I would set it to at least 400˚F and place the water into a glass measuring cup and into the fryer basket. Check every 4 minutes or so until it’s boiling. Be careful when removing it. Just boiled 4 eggs in my air fryer 10 mins is not enough maybe 12 to 15 min because the yolk was not done all the way. That timeframe worked for us, however, it might be worth me revisiting to double-check my timing. Just got my air fryer and I have been searching for recipes. Thanks for this one. 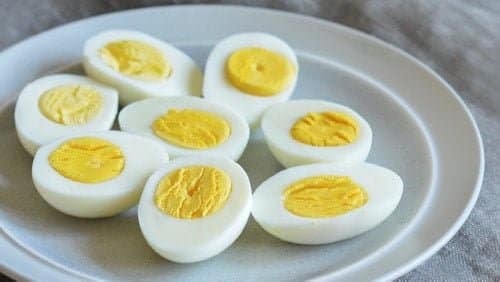 I’ve been Keto for the past year and I eat a lot of boiled eggs. Now I can cook them in my air fryer. So excited. Thanks..! So glad to hear it! You’ll love it!